Lentils are a small, round, lens-shaped legume that comes in many colors and sizes. Colors range from yellow and red to green, brown, and even black. Lentils are inexpensive, highly nutritious, and can be stored for a long time without refrigeration. These features have made lentils a staple food in many cultures across the globe. Lentils contain the third highest amount of protein of any legume, listed only below soybeans and hemp. The high protein content and low cost have made them an indispensable food item in many third world countries and among vegetarian populations. Although lentils are not considered a complete protein, when coupled with grains, such as rice or wheat, all essential amino acids are provided. 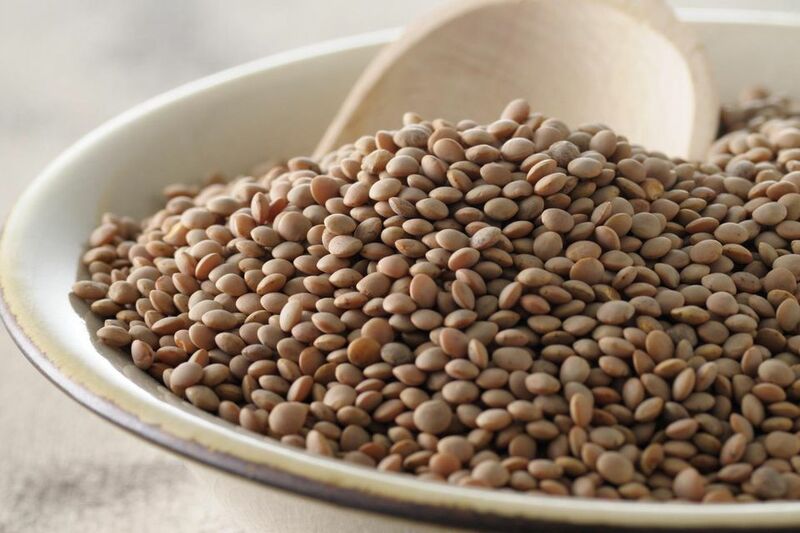 Lentils, as with many legumes, are also high in iron, fiber, and folate. Hulled lentil varieties, such as red and some black lentils, provide less fiber than varieties with the hull intact (green and brown). Although there are several varieties of lentils grown throughout the world, the following varieties are the most common and are most likely to be found in grocery stores or as a recipe ingredient. Brown Lentils - This is the most basic variety of lentil and the most likely to be found in American grocery stores. These small, brown lentils hold their shape well during cooking but may become mushy if overcooked. This variety cooks quickly (in about 20 minutes) and requires no soaking like most other beans. With a subtle and earthy flavor, this variety is good for soups, stews, salads, pilafs, and more. Green Lentils - These light green lentils are quite large (about a quarter inch in diameter) and tend to be slightly flatter than other varieties. Green lentils are very flavorful, remain fairly firm, and retain their shape with cooking. This makes them ideal for salads and pilafs as they will not easily break down with mixing or stirring. French Green Lentils - French green lentils, or Puy lentils, are smaller and darker than regular green lentils and appear slightly speckled on the surface. This variety of lentil remains firm and requires an extended cooking time of approximately 40 minutes. Yellow Lentils - Yellow lentils are sweet and nutty and have a reddish interior flesh. These lentils break down quickly with cooking and therefore are better suited for dishes that require thickening. Yellow lentils are popular in Indian "dhal" recipes where the lentils are cooked down to a smooth puree. Red Lentils - Red lentils are yellow lentils that have been hulled and split. They are a light red to orange color, small in size, and create a very smooth puree when cooked. Because they have been hulled and split, red lentils are also the quickest cooking variety. Black/Beluga Lentils - Black lentils are small and quite round in shape. They are often called beluga lentils because they resemble beluga caviar when cooked. Although the hull is dark black in color, the flesh is light and creamy. Black lentils are available whole, hulled, or hulled and split. Lentils are most often purchased dried and have an extremely long shelf life. Dry lentils should be stored in an air-tight container away from heat and moisture. An air-tight container will not only keep moisture out but also insects, which easily infest dried grains and legumes. Lentils can be purchased in bags like other dried beans, but are also a popular offering in bulk bins. Because lentils are a staple food in most of the Middle East, India, and Asia, check ethnic markets for a greater selection and lower prices.